BOB, or Berner Oberland-Bahnen is operating narrow gauge (1 m gauge width; network length 24 km, 1500V, opened 1890) trains which use a third cog wheel for the steepest slopes from Interlaken up along the two valleys of the Weisse L�tschine and the Schwarze L�tschine to the villages of Lauterbrunnen and Grindelwald, respectively. Typically the trains start from Interlaken as a combined train, which is then split into two halves at Zweil�tschinen where the two valleys split. Both Lauterbrunnen and Grindelwald are famous ski resort villages and trains of other companies (WAB and BLM) as well as cable cars take skiers further up from them to even more elevated ski slopes. A closeup of the Berner Oberlandbahn BOB Abeh 4/4 2. series EMU no. 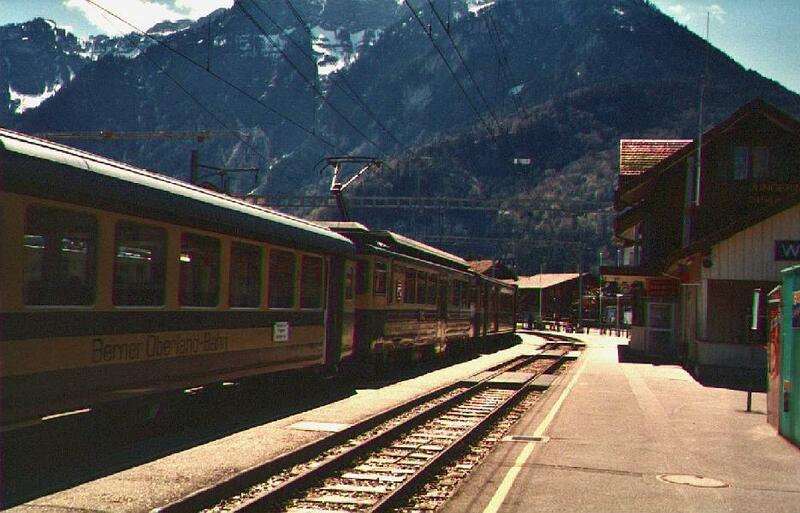 311 in the middle of a train to Grindelwald and Lauterbrunnen at the Wilderswil station. BOB ordered three of these new series ABeh EMU�s in 1986. It�s built by SLM and BBC, it weighs 45 tonnes and its maximum speed is 70 km/h on normal and 35 km/h on cog wheel tracks. 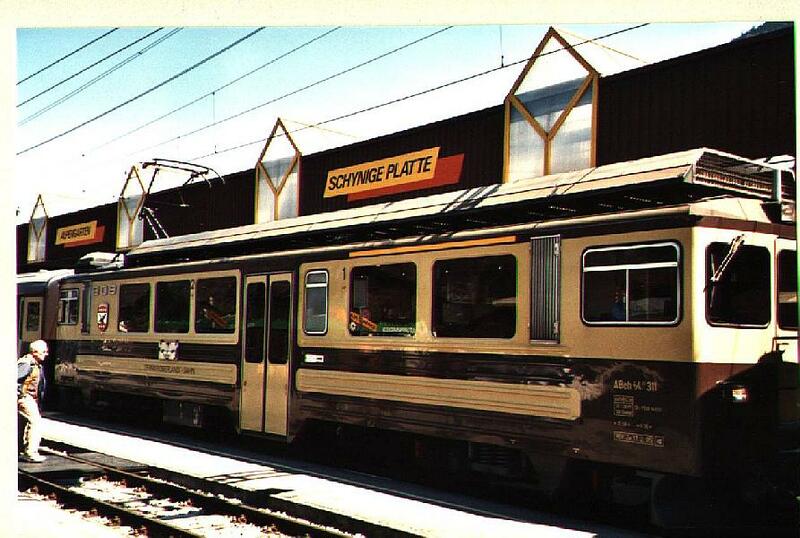 Notice the small first class passenger department marked by a yellow line over the window. ABeh 4/4 2.series number 313 of the Berner Oberlandbahn BOB leading a long train from Interlaken, arriving here at the Wilderswil station. A similar EMU no. 311 is in the middle of the train as a second locomotive. 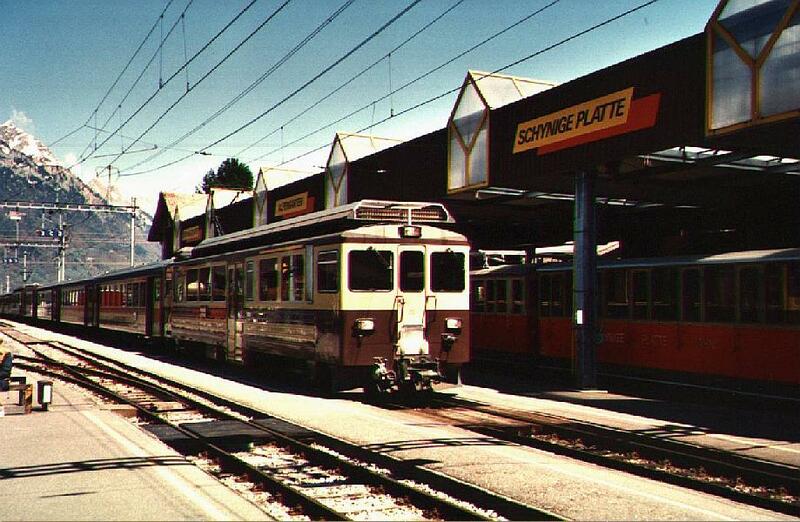 In the background to the right old museum trains of the Schynige Platte Bahn from the beginning of the 1900s.